With 71 days until the January transfer window opens, many teams are beginning to tilt the blinds and assess their options. The winter window is very much ‘level 2’ in the game that is transfer dealings – gone are the summer comforts of infrequent matches and ample negotiating time; enter injuries, premium prices and an all-or-nothing approach. As such, the January transfer window arguably requires much more planning than its off-season sibling. Whilst clubs often quickly identify who they want to buy, most need to make tough decisions on who to sell to accommodate this activity. 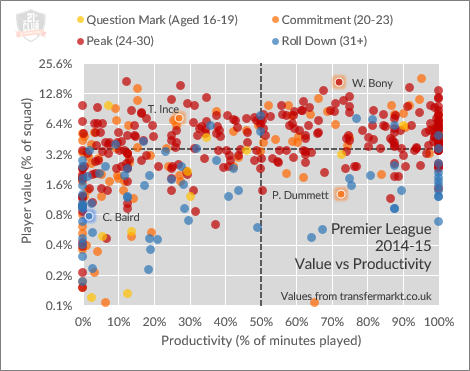 There are a few top-level factors to consider when making these decisions, three of which are distilled into the chart below, which graphs Premier League players’ market value (as a proportion of the team) against their productivity (here measured as minutes played, but could easily be performance). The players are also coloured by their lifecycle age group. This is ultimately a decision-making framework for squad evolution, and not just applicable to the Premier League. Most clubs would ideally see a positive correlation between their high-value (typically high-cost) players and their playing time, but for various reasons – manager preferences, injuries, rotation – we are left with a number of players in the top left and bottom right quadrants. Take players in the top left: high value, low productivity. For players aged above 23, remaining in this quadrant for another 6 months may cause their value to depreciate, and thus January might be the time to ‘cash in’. What’s more, these players are likely to be a bigger burden on the wage bill. Meanwhile, players aged 23 or younger in this quadrant might be worth loaning out, for many are undisputed potential stars who perhaps need playing time to develop. Towards the bottom right, you have a mix of old pros who are probably worth retaining (if the wage bill can manage it) mixed with younger players who will potentially see their own value rise through increased exposure. Perhaps these pre-peak players are ones to lock into long-term deals. Countless other factors – dressing room influence, injury record, squad depth – means that there are few straightforward and all-encompassing answers. However, in the two months of planning before the phones start ringing again, it’s essential to have a clear vision of where the value lies within your own squad (both now and in the future) and a framework for making decisions in January. Your best negotiating position is to have your own strategy in place. Omar Chaudhuri has created 128 entries.